Today is Martin Luther King, Jr. Day, and I hope you have a great day. I will be performing an act of service by heading into my office and working on a pro bono case for a veteran. I will also be reflecting on Dr. King's words, which are so powerful because they are also timeless. The quote above is one of my favorites. The first week of the 40-day legislative session concluded last Friday. We anticipate a quick-moving session, meaning that sine die is expected to be in the middle of March. This upcoming week, we will be in session from Tuesday through Friday. 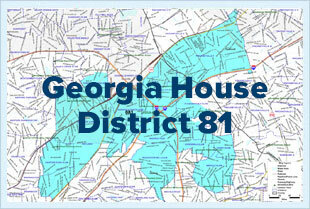 Both the House and the Senate voted to move Georgia's primary date to May 20, 2014. In addition, qualifying for those who would like to run for office in 2014 will be March 3-7, 2014. These changes were required by a court order that held that Georgia's election laws were not in compliance with the Military and Overseas Voter Empowerment (MOVE) Act. MOVE was passed in 2009 to expand the Uniformed and Overseas Citizens Absentee Voting Act, and held that ballots need to be sent to citizens and military who are overseas at least 45 days before a federal election. In Georgia, the primary run-offs occurred only three weeks after the primary, which was not in compliance with this law. Consequently, our election laws needed to be revised. DeKalb Delegation meeting on new cities: This Wednesday, January 22nd, from 6:30-9:30, the joint House and Senate Delegation will be hearing presentations by each of the proposed new cities as well as the County. The meeting will be held at the Maloof Auditorium, 1300 Commerce Drive, Decatur 30030. The last 40 minutes of the meeting will be devoted to public input. Given the importance of the cityhood issue to most of my constituents, I hope that you will be able to attend. Your input is important to me. I've been receiving emails and calls from constituents about several issues, particularly cityhood. I appreciate every message and call that I have received, and I am trying my best to solicit input from the community. With respect to cityhood, the discussion about incorporation is incredibly important to the future of our community so please let me know your preference. To date, I have heard from constituents who favor each of the three proposed cities, who oppose each of the proposed cities, and who favor remaining unincorporated. If you have not already shared your opinion with me, please let me know what you think. I'm proud of my outstanding team and we are ready to work hard again this year. Ann Abramowitz continues as my Chief of Staff (ann@repscottholcomb.com). Many of you know her from her work with me in the district and at the Capitol since I began serving in 2011. Ann is also a psychology professor at Emory. Our new legislative aide is Scott Riley (sriley@repscottholcomb.com). Scott is a recent graduate of the University of Georgia who has interned in Atlanta and Washington, D.C. Michael Smith (Michael@repscottholcomb.com), who served as our legislative aide during the 2012 and 2013 sessions, will continue as our technology specialist. Cynthia Danzey is my Administrative Assistant at the Capitol and can be reached via email at cynthia.danzey@house.ga.gov or 404-656-6372.